Free download Startup Faster! latest version. 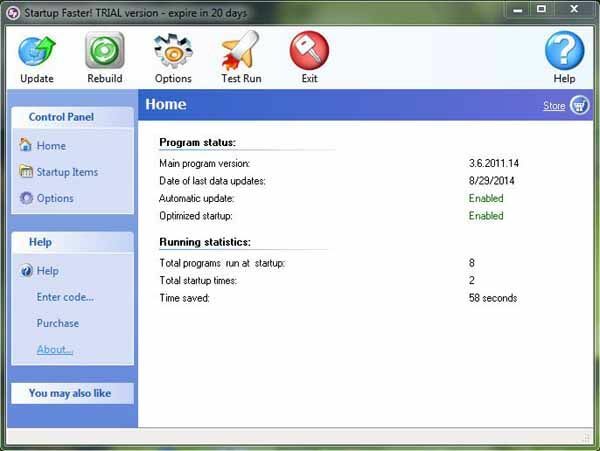 It is a system utility program that is used to speed up the starting of a system. It is published by UrSoftware. If you’re tired of slow system start up and you have to wait a lot to run your system properly after starting up, then here is the solution to your problem. Say thanks to the developers of such a useful application. It is really an annoying thing to wait patiently while the system starts up. Startup Faster optimizes the programs that run automatically as the system starts. It reduces the time taken by that software during startup. You can also see the details that how many software run on startup and how much time is saved using this tool. You can also test its performance without restarting your system. You just need to click on Test Run and the software will perform the startup, opening all startup programs. It will also display you the statistics that how many programs run on startup and how much time is saved etc.Moreover, you can also unselect the program to stop them running on startup. You may go to Startup Items listed in a column on left side with the label as Control Panel. It will show you a list of all the programs that run automatically on startup. You may add new programs by clicking on the button “New” or may delete any selected program from the list by clicking on Delete button and the program will not run on startup. In the Options of software going to General Options you may check/uncheck the different features of the utility as Enable StartupAgent, Show StartupAgent icon in tray, Disable Startup Faster and Run all programs minimized that will force all the programs to stay minimized while startup i.e. they will not pop-up on your screen to disturb and irritate you. While another option is listed as Look & Feel that contains two options of transparency of the window of the program and minimize window on startup i.e. the program also minimizes itself too as well as the other programs.